your pet should be examined by a veterinarian. Imagine how your own teeth and mouth would feel if you never brushed your teeth or visited a dentist. Dry food and chew toys help clean some of your pet's teeth, but they don't clean teeth at the gumline where most dental problems begin. In animals, as with people, routine dental care is essential for puppies and dogs. For a few days prior to starting your home dental care program, merely stroke the outside of your pet's cheeks with your fingers. This will accustom your pet to having your hands near its mouth. Your pet may also accept this as an extension of petting. The use of breath spray. Petrodex Breath Spray is formulated to help control bad breath and promote oral hygiene. To get started with the application of breath spray, gently pull back lips and expose the back teeth. Spray teeth, gums and mouth. Although using Petrodex Breath Spray may be the easiest method of home dental care, there should be some form of rubbing or abrading of the tooth surface at the gum line when applying the breath spray. This act gently massages the gums. For best results, use the Petrodex Toothbrush, Finger Toothbrush or a Petrodex Pre-Moistened Dental Pad. 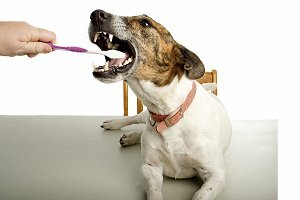 Introducing your dog to tooth brushing is not difficult. It takes only a few minutes a day. Fortunately, the outside surfaces of the teeth need the most attention and they can be easily reached. Tooth brushing is the most effective method in cleaning your dog's teeth at home. The cleaning action of the bristles along the gum line is critical in maintaining the health of the teeth and gums. With some dogs and puppies, using a finger toothbrush may be a more comfortable procedure in the beginning. The finger toothbrush may help puppies and dogs become accustomed to having hands around their mouths. Once your dog has become familiar with this step, introducing a bristle-type brush should be readily accepted. Remember, acceptance by your dog is an important key in making this new procedure comfortable for both you and your pet. To introduce your dog to the toothpaste, simply apply a small amount of Petrodex toothpaste to your finger. Because the taste of Petrodex is so appealing, most dogs will lick it from your finger. Then apply Petrodex to the toothbrush and allow your dog to lick it off. This will familiarize your pet with the toothbrush and assure acceptance of brushing. Gently pull the lips and cheeks up. Begin brushing with short, back-and-forth strokes at the gum line. Brush only a few teeth the first time. Give lots of reassurance and praise during this process. Increase the number of teeth brushed each time until your dog accepts this routine willingly. Diet is important in minimizing plaque accumulation. Soft, sticky foods promote plaque formation. Hard food is helpful for some cleaning action. However, it does not adequately clean or prevent tartar build-up at the gum line. If you have not been routinely caring for your pet's teeth, the plaque and tartar build-up may be excessive. Hardened tartar should be professionally removed by your veterinarian. If your dog is a "struggler," you may need some help. An initial restraining method worth trying is to wrap your dog in a towel with just the head protruding. This confinement allows better control. Do not use human toothpaste as it may cause an upset stomach for your dog. Baking soda has sometimes been suggested for use. However, besides the problem of taste, baking soda contains a high sodium level. This sodium level may cause health problems in some animals, especially those with a heart condition. Do not use human toothbrushes. The bristles are generally too hard and may injure gum tissue.